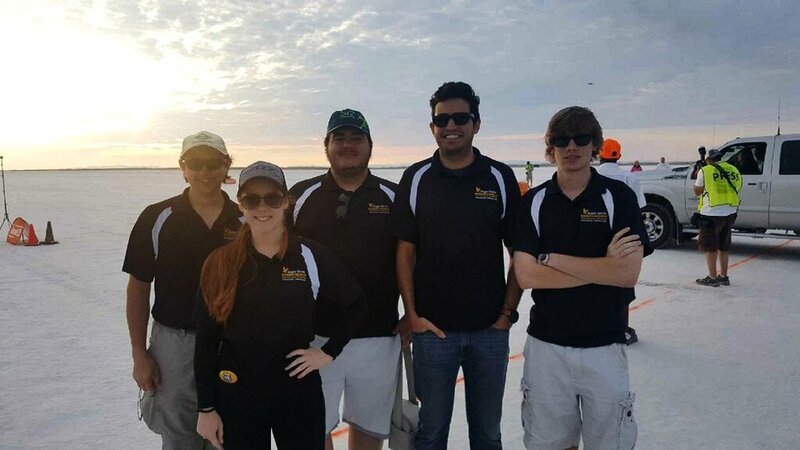 This summer, six members of Eagle Works got the opportunity to work on the Land Speed Record project full time as Interns, surging the team's progress forward. While much was learned over the three month break, the biggest takeaway for the team was a three day trip to the Bonneville Salt Flats for the 69th annual Speed Week. During the trip our team gained an immense amount of knowledge from the Salt Flat's Veterans, and came up with many great ideas for the project. Those ideas will be implemented throughout this coming semester, which starts Monday, August 28th. The team is looking forward to getting back to work, and making great progress this semester! If you are interested in joining the team, come visit our booth at the activity fair on September 7th, or contact Reece Ticotin at ticotinr@my.erau.edu. From Left to Right: Johnathan Crossley, Team Member; Julia Mihaylov, Lead Cooling Engineer and Secretary; Sean Rager, Director of Research and Development; Reece Ticotin, President; Alexander Benz, Lead Steering Engineer.